csimsoft - Thaker Simulation Technologies, LLC. 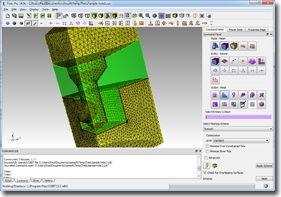 Trelis - Meshing software for FEA, CFD and more..
Trelis is csimsoft's next generation pre-processing and meshing software, based on the renowned Cubit platform. However, Trelis is more than just a rebranded Cubit: Trelis includes many extra features and capabilities that make it one of the most powerful and one of the fastest commercially licensed meshing tools available today. Trelis PRO: For users who need a comprehensive pre-processing tool with both CFD and FEA meshing technologies. Try out Trelis for yourself, and see why Trelis is one of the most advanced mesh generating tools around! Request a free 30 day trial today! Please contact us for more information on Trelis' capabilities, licensing mechanisms and costs, support and training.